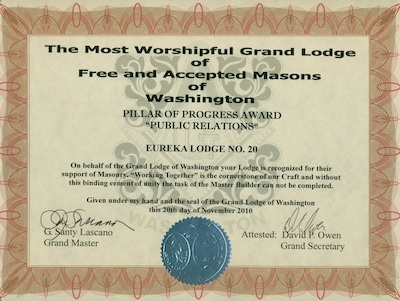 In November 2010 we received the Pillar of Progress award for Public Relations from The Masonic Grand Lodge of Washington, F&AM. This award recognized our interaction and relations with the local community of Green Lake in Seattle and the larger community of the Puget Sound Region in the State of Washington. Eureka Lodge #20 promotes Science Education in the Youth of the Green Lake Community and provides assistance with the Science Fairs for youth held in the greater Puget Sound region. 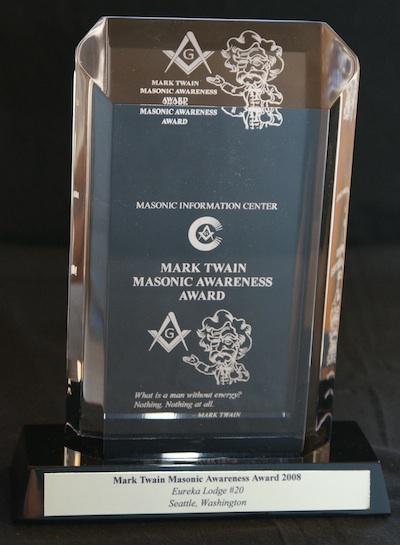 In early 2009, we were notified by the Masonic Information Center that Eureka Lodge #20 was a winner of the Mark Twain Masonic Awareness Award for 2008. This national award recognizes lodges that have demonstrated exemplary work in constructing a positive Masonic identity within the lodge and for the local community. Eureka's emphasis on science education in the community was the major reason for our recognition. The formal presentation of this award was at the 2009 Grand Lodge Annual Communication in Spokane, Washington. 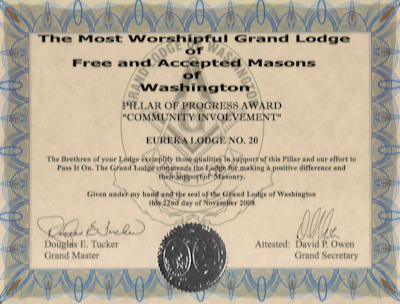 In November 2008, we received the "Pillar of Progress" Award, Community Involvement Category, from the Grand Lodge of Washington, F&AM. This award recognized our support for improving science education in Washington State.